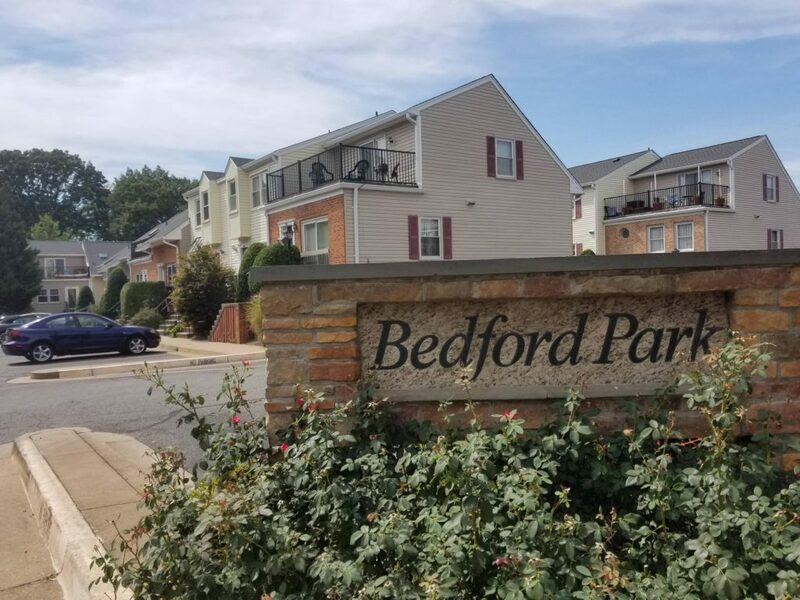 Bedford Park condominium in 2 sentences: Bedford Park is a townhouse-style condominium community located in the Lyon Park neighborhood and situated 15 minutes walking distance from the Clarendon Metro. The community is made up of one and two-bedroom floor plans, the larger of which are two-levels and can feature cathedral ceilings and rooftop decks. Masqueraded as townhouses, the Bedford Park condominiums are located just off of Washington Boulevard in the Lyon Park neighborhood. They community takes up almost the entirety of the western side of North Bedford Street. Even though the condominium is fully-entrenched in a quiet neighborhood setting, the Clarendon Metro is still just about a 15 minute walk away. The community was built in 1983 and contains a total of 121 residences spread out across a number of different buildings. Most condos at Bedford Park are three stories and have a one-bedroom unit on the first level, and a two-bedroom, two-story unit on the second and third levels. The first-level one-bedroom condos will still be above grade. They are not of the English basement variety where they would be partially underground. First floor units are at grade or above grade and can sometimes feature an outdoor patio. One bedroom floor plans will come in at 612 square feet. This is a little bit on the smaller side. However, floor plans will have good separation between living rooms and kitchens. The kitchen is usually elevated while the living room is sunken. Classic 1980’s. All two bedrooms are above 1,000 square feet and most of the Bedford Park Arlington VA floor plans are two stories. You will occasionally find a two-bedroom that is one story, but there are significantly fewer of these floor plans in the community. The two bedroom layouts are similar to one-bedroom floor plans, but do have the additional master suite upstairs. The upstairs bedrooms often-times come with an outdoor deck and cathedral ceilings. These two features make the two-bedrooms stand out a little bit from other condos in Arlington VA that could even be priced a bit higher than at Bedford Park. There are no real community amenities. The real amenity is the location. Not only are you walking distance to Clarendon, but you are also nestled up against the quiet, tree-canopy-of-a-neighborhood known as Lyon Park. There is a bike trail right behind the community. You are right around the corner from Long Branch Elementary School. And, you are just a stroll away from the Lyon Park Community Center which hosts some fantastic neighborhood events like the Halloween bonfire and the spring fair, among many others. One downside of Bedford Park is that there is no garage parking. Surface parking is found throughout the community. There’s also no amenities. And you are not immediately next to urban amenities (a 10-minute walk! The horror!). The best parts about living at Bedford Park start with the price. One-bedroom condos start at under $300,000. You do not need to live on top of the Clarendon Metro and pay Clarendon prices to enjoy the neighborhood. Bedford Park is the epitome. There are parks, quiet streets, and bike trails that surround the community. And if you want a little more action, the community is just a few minutes away from everything you are looking for.